St Edmund, king of East Anglia became revered as a royal martyr after he was killed by pagan Danish invaders in 870. In the 10th century, his remains were taken to Beodricsworth, which became Bury St Edmund's, where his status of royal martyr saint was promoted. St Edmund might have been recognised as the patron saint of the English but for heavy competition from contenders such as Cuthbert and George. In this book, two accounts of Edmund are bound together, Abbo of Fleury's account of his martyrdom and a collection of stories of his posthumous miracles believed to have been written by Hermann the Archdeacon (who may have really been named Bertrann). 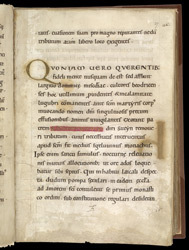 Hermann's (or Bertrann's) account of Edmund's miracles is important as a document of the promotion of the cult of Edmund and because it provides information on events of the late 10th and early 11th centuries, during the reign of King Aethelred the Unready. The power of Edmund's body at Beodricsworth (Bury St Edmund's) is evoked throughout the miracle stories, a powerful promotion of his cult and its community of monks. Edmund's name is written in gold and framed on a red field, visually expressing his martyrdom and sanctity.